During July 2003 a number of searches were made for Comet 104P/Kowal 2 (discovered in 1979 and then seen again at its 1991 and 1998 apparitions). In 1998 it was several magnitudes brighter than predicted, evidently undergoing an outburst. A series of exposures were made on July 14/15 2003 and stacked to compensate for the predicted motion of the comet (0.36"/minute in p.a. 300°). When these images were examined an 18th mag object was seen to be moving with about half the expected motion of the comet (0.18"/min in p.a. 336°). The MPC Minor Planet Checker was used to see what asteroids were in the vicinity but none matched the position. Further exposures were taken during the night and the positions reported to the MPC. A second night of positions was needed to confirm the object and the MPC's New Object Ephemeris Generator was used to produce a prediction for the next night. Unfortunately the next night was very poor with the almost full moon only 28° away, haze and high cloud. A total of 52 minutes of exposure over a period of nearly 3 hours was eventually required to record the object well enough to measure just two positions and these were also sent off to the MPC. The second night turned out to be vital - the two nights allowed the object to be linked to a single night of positions from LINEAR on 2003 July 4th and also a single night of positions from LONEOS on 2003 June 26th. Subsequently a pair of positions from the Sloan survey on 2001 Feb 20th were linked as well as positions from LINEAR from 1999 Oct 10th, 20th and Nov 5th. Although the object had been detected by the big surveys on a number of occasions in the past, the two nights obtained on the nights of 14th and 15th July 2003 allowed all the observations to be connected and therefore discovery was attributed to Great Shefford! The discovery in July 2003 was just a few weeks before perihelion, so 2003 NL8 was almost as well placed as it can get and was followed until Nov 2003 when LINEAR reported the final positions for that apparition. The next opposition in January 2005 was much less favourable, with the object peaking 2.4 magnitudes fainter, at +20.7. Combined with this, the object was placed in the Milky Way, in Northern Monoceros, close to the Western border with Canis Minor. 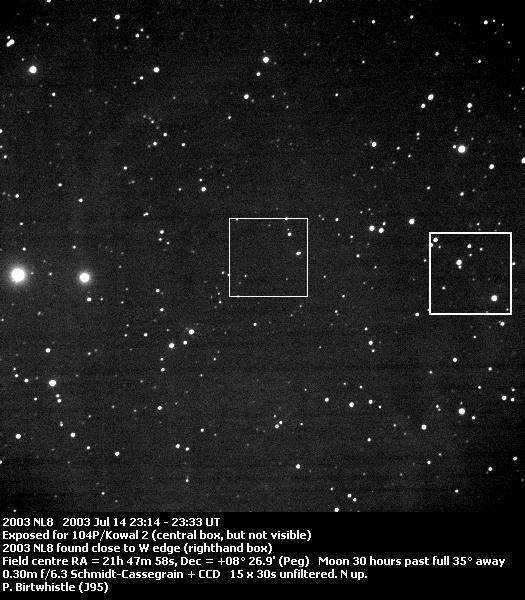 Nevertheless, a run taken early on 6th Jan 2005 showed the telltale movement of the faint asteroid in amongst the stars of the Milky Way and positions were subsequently submitted to the Minor Planet Center. With these positions 2003 NL8 had been observed at 5 oppositions and the orbit listed with an uncertainty of 1 (less than 5" arc of run-off in the in-orbit longitude per decade (see the Uncertainty parameter U). 2003 NL8 received the permanent number (159786) from the Minor Planet Center following further observations being made at the favourable opposition during May and June 2007. It had been observed at a total of 6 oppositions by then.